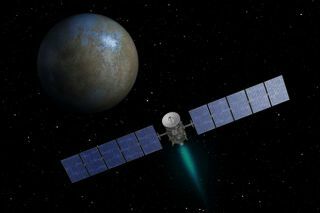 Artist's concept of NASA's Dawn probe at the dwarf planet Ceres. Dawn arrived in Ceres orbit on March 6, 2015. NASA's Dawn spacecraft arrived at Ceres last Friday (March 6), becoming the first probe ever to visit a dwarf planet. Dawn is currently spiraling down to its first science orbit, which it's scheduled to reach on April 23. The spacecraft will then commence a 15-month investigation of Ceres, which at 590 miles (950 kilometers) wide is the largest object in the main asteroid belt beyond Mars and Jupiter. Space.com recently caught up with Dawn principal investigator Chris Russell, a professor of geophysics and space physics at UCLA, to discuss Vesta, Ceres and what Dawn's legacy will be. Space.com: So Dawn already studied Vesta up close, and now it's at Ceres. What are you most excited about? Chris Russell of UCLA, principal investigator of NASA's Dawn mission. Chris Russell: Let's just look at it from the building block theory. We think of these protoplanets as being the fundamental building blocks of the solar system, or at least the terrestrial planets. You can think of the Earth as mainly being built out of Vestas. Vesta is a rocky exterior and an iron core; that's what we found when we got there, and that's what we expected. And the Earth is mainly an iron core with rock around it. However, we have water [on Earth]. Where did the water come from? The Rosetta mission didn't find the right water out there on Comet 67 C-G [67P/Churyumov–Gerasimenko]; they found the wrong isotopic ratios. So the water isn't coming from a large distance. It's probably coming from the inner solar system, and Ceres is a body with a lot of water on it. One quarter of the mass of Ceres is water, and three quarters is rock. If we had just a few Ceres-type bodies colliding with the Earth, we can explain where the water came from. Space.com: What do you hope to learn at Ceres? Russell: We live on a very complex planet, and we have thousands of geophysicists and geochemists and geologists prowling around trying to understand the various things that are going on. These smaller bodies are much simpler, but they have planetary processes that took place — and, in the case of Ceres, we believe, are taking place at the present time. So we're learning more about planetary physics by having a situation in which we can look at simpler objects and seeing how they behave. That's sort of at the top level. The other things, the measurement objectives, are to weigh Ceres very carefully, measure its size very carefully and take a look at its gravitational field and infer what the inhomogeneities in it mean — how big the core might be, what are the various regions of high density and low density on the body. And we'll study the surface very carefully and look at the craters. We're going to be looking a the morphology of the craters — not just looking at the size of them or the number of them, but looking at what size craters display this sort of behavior, what size display that sort. Also, are there landslides, are there filling events, are there things that look like rivers? That would be interesting. So we'll be looking at features that you associate with water or flows of one sort of another on the surface. We'll do typical planetary geology, more similar to what we do on Mars than what we did with Vesta. Space.com: Could Dawn's measurements reveal whether Ceres has a subsurface ocean, as some researchers suspect? So we may be able to make some measurements that give us an indication indirectly of the various possible solutions. We will be making as many geophysical, geochemical and geological measurements as we can and then infer what structure might have led to that sort of behavior. Space.com: You also hope to figure out just what causes those mysterious bright spots inside that Ceres crater, correct? Russell: When you go to an asteroid or to the moon, you see a lot of cratering on the surface. It's sort of like a fractal pattern — you look at it on the large scale and the small scale, and it all looks about the same. In this case, the feature is very reflective. There isn't something there signaling us actively. It's signaling us passively; it's reflecting the sunlight. It's consistent with reflecting all of the light if the spot is small enough. Now, we don't know what size it is, so we can't tell if the albedo is 40 percent, 60 percent, 80 percent or 100 percent, but it's probably in that range someplace. One thing that's very good in the solar system at reflecting sunlight is ice. For example, [Saturn's moon] Enceladus has an albedo of about 100 percent. But there are people who are holding out for salt — not necessarily table salt, but salts of various minerals that may be white in appearance. So we have sort of a dichotomy of opinion in the team as to whether this has a dry or wet explanation. But we'll get to the bottom of this when we can resolve the bottom of the feature. Space.com: You'll be studying Ceres from orbit through June 2016, if all goes according to plan. What do you think Dawn's legacy be when it's all said and done? Russell: Our first legacy was going to Vesta. Vesta had explained itself to us quite well by sending us all those meteorites, which we call the HED meteorites — howardites, eucrites, and diogenites — and those meteorites were taken apart by the geochemists and analyzed very carefully. They came up with both a model for Vesta and a model for solar system evolution. So we went to Vesta, and the first thing we did was show that the body the geochemists had predicted from the meteoritic evidence was the body that we found. That in turn validated the solar system model. It wasn't really in doubt in most quarters, but we were able to go out into space and give credence to that particular model. I consider that an important legacy. At Ceres, we're basically finding the water. There's certainly a lot of water at Ceres; that suggests there were other bodies similar to Ceres that are not with us anymore but delivered their water to other places in the solar system. So we're learning more about the delivery of water, how water was gathered and maintained for 4.6 billion years out in the middle of the asteroid belt. That will probably give us a little courage to go out and explore some of the smaller bodies in the solar system that people have been calling main belt comets. In Ceres, we have a huge main belt comet with a very large supply of water inside it. And ion propulsion is very, very important to this particular mission. By using ion propulsion, we were able to do things that larger missions could not have done. [Dawn is the only mission ever to orbit two objects beyond the Earth-moon system.] It kept our costs down but enabled us to behave in a particular way. Although our legacy to science is with Vesta and Ceres, the legacy to space exploration, I think, is really high in that when other people appreciate what Dawn did, we will doing a lot more of this. It takes a little bit of extra time, but it's safer and cheaper, and that's important.